Marrying another bookworm has had its perks. Back before Eitan’s eye issues made it impossible for him to read from print books without pain, he bought books all the time. Even though our current stock is only a small fraction of his original collection, and even though we’ve been living together for eight years, every once in a while I’ll go searching through his old books and discover something interesting. This book was one such discovery. That’s not Benjamin Netanyahu, for the record; it’s Benzion, Bibi’s father, who was one of the most prominent modern scholars on late medieval Spain. I’ve been wanting to get my hands on any or all of his scholarly works on the Inquisition and the conversos (because hi, it’s me), and I was astonished to find this book on my own bookshelf a couple months ago. (Eitan says he bought it used someplace a long time ago and forgot it existed.) 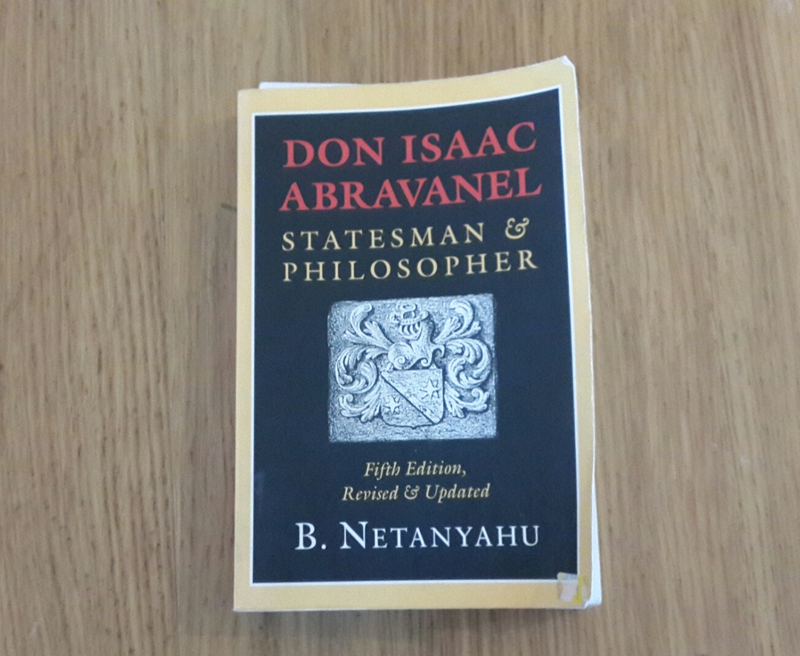 Don Isaac Abravanel is apparently B. Netanyahu’s first book, originally published in 1953. In the months that followed I read the book and developed a keen interest in Abravanel. I found his character weaving itself into a short story I was writing during that time, which pushed me to read the book more deeply as well as some of Abravanel’s Biblical commentary in the original Hebrew. I knew Abravanel as “Abarbanel,” (the commonly accepted pronunciation of the name in the Jewish community)–at first as a Biblical commentator whose opinions were brought into my classes on the Torah and the Prophets, and then as a historical figure who had a pivotal role during the period of the expulsion of the Jews from Spain in 1492. But this biography really brought everything together for me about his character and his role in history. So allow me to introduce you to Awesome Jew of History #2: Don Isaac Abravanel. A portrait of Abravanel. Source unknown. 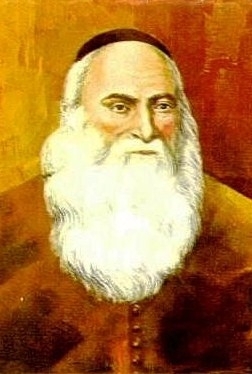 Don Isaac Abravanel was born in Lisbon in 1437 to one of the wealthiest, most distinguished Jewish families in Iberia. His grandfather, Don Samuel, served three successive Castilian kings, and in the days of Enrique III, he had assumed the office of contador mayor–the highest position in Castile’s financial administration. He was outspoken in defense of Jews and Judaism in his native Seville, and the Jews of Spain considered him their leader… so you can imagine how shocked and horrified they were when he converted to Christianity, apparently voluntarily. As a result of his conversion, the older of his children cut off ties with him and moved to Portugal. Among those estranged sons was Don Judah, Don Isaac’s father. Don Judah did well in Lisbon, apparently becoming a royal treasurer for João I, and Don Isaac was brought up with a great deal of wealth, familiarity with the nobility and royalty, and a thorough Jewish and secular education. He began writing Biblical commentary and philosophical works as a young man. And I can tell you as someone who translated bits of his writing to work into my story–the man was overflowing with the words of the Bible even when he wasn’t talking about it. The text I translated was mostly autobiographical, and yet every sentence made multiple Biblical references. If I was unsure about some phrase or other I just Googled it and immediately found it in Psalms or Jeremiah or Deuteronomy. As an adult, he moved into a position of power under Alfonso V, who appointed him treasurer. But the problem with getting friendly with a king of Portugal (or any medieval monarch, for that matter) and establishing yourself in his royal court, is that there’s a fast turnover rate, and more often than not, the following king is going to suspect you of other loyalties. That’s what happened to Abravanel. When João II took the throne, he suspected Abravanel of treason and eventually put out a warrant for his arrest. Abravanel was certain of his innocence, but understood that he stood no chance of convincing the king, so he fled to Castile. The king seized all his assets. Thus Abravanel lost his entire fortune, and had to start over in a new kingdom. But guys like Abravanel don’t really manage to keep a low profile. Abravanel employed his exceptional knowledge and skills, and slowly worked his way up the social ladder. His skills eventually came to the attention of one King Fernando of Aragon. Fernando and Isabel employed him as a financier, and he became second only to Abraham Senior as the highest-ranking Jew in the kingdom. It’s interesting to note that despite everything, Abravanel seems to have had something resembling a good relationship with the Catholic Monarchs. Fernando was a very slippery, poker-faced kind of guy, managing to make everyone think they were getting along great while stabbing them in the back. So, in 1492, when the Catholic Monarchs captured Granada and issued the Alhambra Decree, Abravanel was in a very unique and crucial position, having a place of power and esteem within the royal court. He and Abraham Senior worked tirelessly to cancel the decree. They had an audience with Fernando three times, appealing to his practical side, offering him an enormous bribe to be collected from the Jewish community. But Mr. Aragonese Poker-Face never committed to anything, always dismissing them with an “I’ll think about it” kind of response. Thus unsuccessful, they tried appealing to Isabel. With Isabel, Abravanel took an entirely different approach. And so, Don Isaac Abravanel failed to reverse the fate of his people. Abraham Senior converted to Christianity in order to stay in Castile, and Abravanel left with his brethren, losing his fortune and his honor for the second time. Abravanel moved to Naples. Italy was very unstable at the time and he had to move around a lot in the coming years because of various wars. He eventually settled in Venice, and he died there in 1508. Like all of his contemporaries, Abravanel struggled to make sense of the expulsion. As you know, it was one of the most highly traumatic crises in Jewish history, and many Jews found themselves in a place of deep discouragement and despair. Some feared that the expulsion marked the beginning of the end of the Jewish people. Abravanel gave the Jewish people hope. He gave great detail and vivid color to a very theoretical idea of the bright future that lay somewhere ahead of all this gloom. Our national anthem is called “The Hope” for a reason. Hope is what has carried us through and kept us moving forward even in the darkest of times. For that, if not for the vast library of intriguing ideas and scholarship he left behind, and for his tireless efforts to make the world a better place for Jews and non-Jews alike… he deserves to be remembered as a great man, and an Awesome Jew of History. The previous Awesome Jew of History was King David! Is there an awesome Jewish historical figure you’d like me to write about? Let me know! Being in the States was many things for many different reasons, but one thing that I felt there this time was… strange. Back when I was a kid and still a new immigrant, going back to the USA was a huge relief. When surrounded by people speaking Hebrew, I didn’t even realize how much I was straining to understand even when I wasn’t trying. It was only when I was surrounded with English again that I realized how much easier that was. And as you mentioned, Americans are so nice and upbeat when interacting with strangers. This used to be so refreshing for me. This is not just my own quirk, either. There’s a mitzvah known as kiddush Hashem, “sanctification of the Name”, that specifically involves presenting yourself as a positive example of the Jewish people to the world. Throughout history, the whole Jewish nation has always been judged by the actions of the few–usually for the worse :-/ and that can be dangerous to all of us. I often feel the same way about being an Israeli. I sometimes get friend requests on Facebook from random people in all kinds of random countries, and when I ask them to what I owe the pleasure, often it’s because they love and support Israel. I am willing and proud to take on this role, but especially during these tough political times, it can be a heavy responsibility. As soon as I set foot on Israeli soil, I felt it lift from my shoulders somewhat. Here, I still represent something–observant Jewish women, American olim (immigrants), settlers, what have you, but that’s less pressure than the entire Jewish people and the whole state of Israel. Sometimes I wish I could just blend into the crowd. But I’m always going to stand out… not only because of my religion, nationality, and personal choices, but also because of my unusually high sensitivity and empathy, and sometimes it can be a burden. Blog readers: Yes, I still have an announcement, but give me a little more time to get settled 😉 In the meantime, have you ever felt that you are representing something to the world? What did that feel like? I’ve been thinking about sharing this song with you since it came out, around a year ago. It really captures the character of a Friday in Israel. As you know, I am in the USA now, spending time with family. It’s a wonderful and crazy trip, and also pretty difficult. I don’t get to see my grandparents very often, and especially since my maternal grandmother was recently diagnosed with terminal cancer, the trip has felt like a neverending series of joyful reunions only to be followed up with extremely painful goodbyes. Rabbi Judah the Levi (an 11th century Sephardic poet) writes, “My heart is in the east, and I am in the uttermost west…” and while I do feel that way and miss Israel dearly, I’m realizing that my heart is actually scattered in pieces all over the globe, many of whom are here. And being reunited with those pieces does bring joy, but it also emphasizes how much those pieces are missing in day to day life. So… this song really speaks to me today. The music and performance are by Rami Kleinstein, and the lyrics were written by Noam Horev. Below is my translation. *This is from the kiddush recited on the Sabbath.